Thibadeau Mortuary offers respectable graveside funeral services, which are held at the burial site. Our burial planning experts can help your family plan a truly distinctive graveside service down to the smallest detail. Not only does a graveside service offer an affordable alternative to a full funeral, but this kind of service can also provide an informal, comfortable setting for friends and loved ones to honor their passed loved one. 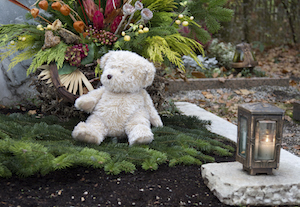 Typically, a graveside funeral service is brief, simple and easily planned as opposed to a traditional funeral, which often includes many details and requires much more planning. Despite common belief, there are many options available with a graveside service. You have the option to limit the graveside service to just the immediate family, or it can be open to all friends and loved ones. After the graveside service, you may choose to hold a memorial service at your place of worship, home or another location of your choice. You can also plan a visitation or "wake" at the venue of your choice the evening before the graveside service. As with all of the funeral services Thibadeau Mortuary offers, we encourage your family to customize the graveside service to reflect the unique life of your loved one. You can tailor the service with flower arrangements, music, photographs and memory boards, religious or poetry readings, personal mementos and even video montages. Some families go so far as to arrange a dove or balloon release during the graveside service. However you want to celebrate the life of your loved one, the compassionate staff at Thibadeau Mortuary Service is here to offer advice and help you plan a truly memorable graveside funeral service. To learn more about our affordable burial planning services, contact us at (301) 495-4950 or info@interfaithfunerals.com, or stop by our funeral home. We'll be more than happy to answer your questions and guide you through the planning process.